Healthy U-Akansha : Good Skin- The secret is Your Refrigerator! When life throws lemons at you, hunt out tequila and salt! But in the mornings, the old favourite is stil ideal: A glass of luke warm water with a twist of lemon and one Tsp of honey to flush out the toxins- also gives you a big boost of vitamin C to keep your skin baby soft. And no I am not talking in pie form. Apples pack a greater wallop of antioxidants (polyphenols). Remember polyphenols are 5 times intense in the skin of the apples than the flesh so don't peel off the skin! Along with other fatty fish, walnuts and flaxseeds, salmon is amongst the highest in healthy fatty acids(omega 3) that does great things for your skin! Omega 3 also reduces the body's production of inflamatory agents that can damage the skin.vegetarian? Have flaxseeds. It has all the benefits of dairy foods + probiotics that help add healthy bacteria to the intestines (read: no acne). Plus it's an excellent skin food as it assists in the production of collagen, helping reduce the signs of ageing. An orange a day keeps those wrinkles away! 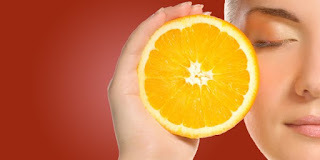 The secret lies in that Vitamin C content of oranges, which is excellent antioxidant. An easy, crunchy way to add extra nutrition and flavour to a meal, as they provide antioxidents and have healthy oil for skin suppleness.Will keep your skin young and glowing.